The Uwaisī is a form of spiritual transmission in the vocabulary of Islamic mysticism that was named after Awais Malik (Uwais al-Qarni). It refers to the transmission of spiritual knowledge between two individuals without the need for physical interaction between them. The term Uwaisīyaan refers to those Sufis who have gained the Sufi spiritual chain from another Sufi without physically meeting them in this world. It can refer to a school of Sufism, and its singular form, Uwaisi, refers to a single individual. In the science of spirituality of Islam (Tasawwuf) the Uwaisi Transmission occurs when the spirits of righteous believers (saliheen, awliya) meet in the world called `alam al-arwaah (the world of spirits) which is beyond `alam al-ajsam (the material plane). Whoever takes knowledge through spirituality from a master in `alam al-arwaah is called "Uwaisi". This means of transmission is considered as powerful and effective as the physical relation of master and disciple. The term "Uwaisi" is derived from the name of Uwais al-Qarni, who never met the Islamic prophet Muhammad physically, yet was fully aware of his spiritual presence at all times of his life. The sign of the Favor of Allah Almighty and Exalted on his servant is to authorize one of His saints to uplift that servant to the Divine Presence. That is why many saints who came in previous times were guides for those who came after through this spiritual (Uwaisi) connection. It is known that many saints have been under the guidance and training of prophets and other saints that lifted them up. 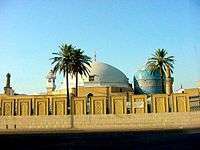 According to Dr. Alan Godlas of the University of Georgia Department of Religion, the "Uwaysi Order, a Shi'i branch of the Kubrawiya, was brought to the West by its shaykh, Shah Maghsoud Angha." There are two recent and distinct contemporary branches of the Uwaisi Order in the West following lengthy legal disputes between Shah Maghsoud's offspring. One is Maktab Tarighat Oveyssi Shahmaghsoudi, headed by Nader Angha, the son of Shah Maghsoud. The other is the Uwaiysi Tarighat, led by Shah Maghsoud's daughter, Dr. Nahid Angha and her husband Dr. Ali Kianfar. They also co-founded the International Association of Sufism. ↑ "The story of Uwais Al-Qarni – Sahih Muslim | AbdurRahman.Org". Salaf-us-saalih.com. 2009-07-23. Retrieved 2016-04-21. ↑ Mohammad, Inam (1978). Hazrat Lal Shahbaz Qalandar of Sehwan-Sharif. Royal Book Co. p. 87. ISBN 0-918437-21-0. See Amazon page ASIN: B0000CQRGQ. Original from the University of Michigan. ↑ "Sufism, Sufis, and Sufi Orders: Sufism's Many Paths". Islam.uga.edu. Retrieved 2016-04-21. ↑ "96-15002 - US 9th Circuit - FindLaw". Caselaw.lp.findlaw.com. 1999-06-17. Retrieved 2016-04-21. ↑ "MTO Shahmagsoudi School of Islamic Sufism". Mto.org. Retrieved 2016-04-21. ↑ "Founders Of IAS | International Association Of Sufism". Ias.org. 2011-11-11. Retrieved 2016-04-21.